Between Fremont and Broadway, some of the problems include cars crashing into median islands, not yielding to pedestrians, excessive speeding, and aggressively passing bicyclists. The causes of these problems are fairly simple: there are far too many cars using NE 7th, these cars want to go faster than is safe, and the cross streets are misaligned so pedestrian crossings are more challenging. This last problem of cross-street misalignment is unlikely to be solved in my lifetime. Why do so many cars use NE 7th in the first place? They use it for two reasons: it is faster and more direct than other routes. Recently, as the economy has picked up so has driving, and the number of cars using NE 7th (along with other streets) as a cut-through route has increased dramatically. The city’s policies and neighbors generally want those trips to be happening on our major arterial streets, like MLK, and not on residential streets like NE 7th. Historical Note: There are a limited number of north-south streets in this corridor between Interstate and 12th Avenue. This is due to the way that the street-grid was laid out in 1873. At the time there were 2 main streets, which we now know as N Williams Avenue and Martin Luther King, Junior Boulevard (MLK). This part of the platting of the town of Albina was somewhat of an afterthought, as there was much more detail on the lower Albina portion of the plat and the upper section that we now think of was subdivided later. I imagine that real estate speculators at the time must have thought that having all the houses “within one block” of these major routes would help sell lots and they could also get away with building less streets. This left Eliot with a pattern of long east-west blocks and short north-south ones. The pattern seems to have been designed for a city focused towards the river with east-west traffic on Russell Street being more prevalent than our current north-south traffic on MLK. To get these car trips back onto MLK, we need to make using NE 7th as a cut-through route impossible or at least difficult enough that it isn’t faster for drivers. 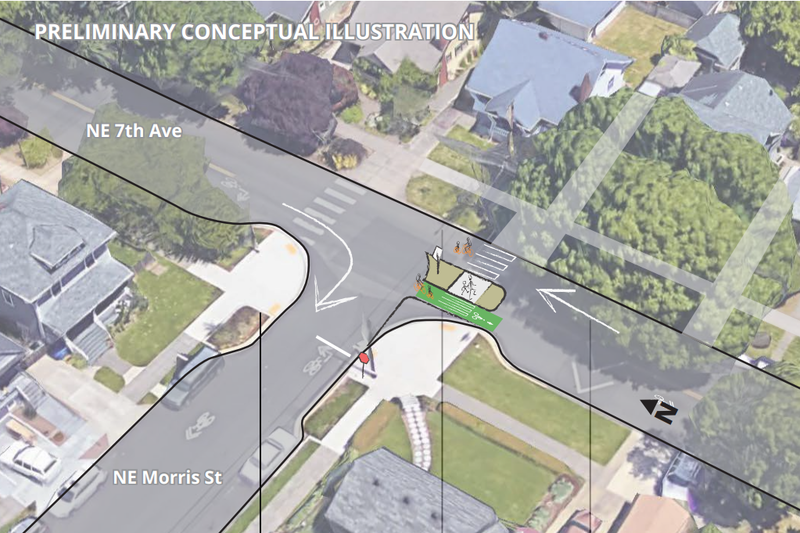 Specifically, the city has proposed several diverters or obstacles would need to be placed in the roadway on NE 7th to prevent automobile traffic from using NE 7th for the whole length from north of NE Fremont to NE Broadway. If installed, these diverters will be a great improvement for people who live on NE 7th and those that travel across or along it while walking or bicycling. Redirecting an estimated 80% of the traffic off NE 7th will make NE 7th a calm and relatively quiet street. Most local trips will be only slightly altered because of the strategic locations of the diverters. The proposal calls 2 half-diverters between Knott and Fremont, one diagonal diverter at NE 7th and Hancock, and one full diverter next to Two Plum Park. Where will those cars go? The City is also proposing to change the traffic signals on NE MLK to optimize traffic. This scares me as I’ve heard while optimizing a road for cars, it’s easy to make the road more difficult to cross on foot or by bike or even in a car. However, the diverted traffic from NE 7th would only represent a 10% increase in the number of cars on MLK per day. The current signal timings for cars and trucks on MLK seem to be quite ineffective, especially at rush hour so this should be a relatively easy change. One could also argue that even if the additional cars can’t be accommodated on NE MLK, reducing the car capacity of our neighborhood would be nice for residents, but that isn’t being proposed for this project. Farther north, between Skidmore and Alberta, the main problem is speeding. The highest speeds on NE 7th were registered in that section. This seems completely due to roadway design – a double yellow line and no speed bumps, combined with short traffic lights that make drivers want to accelerate to catch the light. This happens to be right past King Elementary School – not an ideal spot for speeding. This could be addressed if NE 7th is chosen for the Lloyd to Woodlawn project all the way through Alberta Street. From the bicycle rider’s perspective, the choice between NE 7th and NE 9th Avenues could not be clearer. According to PBOT’s survey, “The vast majority of [survey] participants were very supportive of building the Neighborhood Greenway on NE 7th with additional monitoring and mitigation of traffic in the area. Supporters for the NE 7th alignment mentioned that it’s a direct connection to Lloyd District, the planned Sullivan’s Crossing pedestrian bridge over I-84, and other destinations, and addresses traffic issues on NE 7th, i.e. reduces cut-through traffic and speeding drivers”. 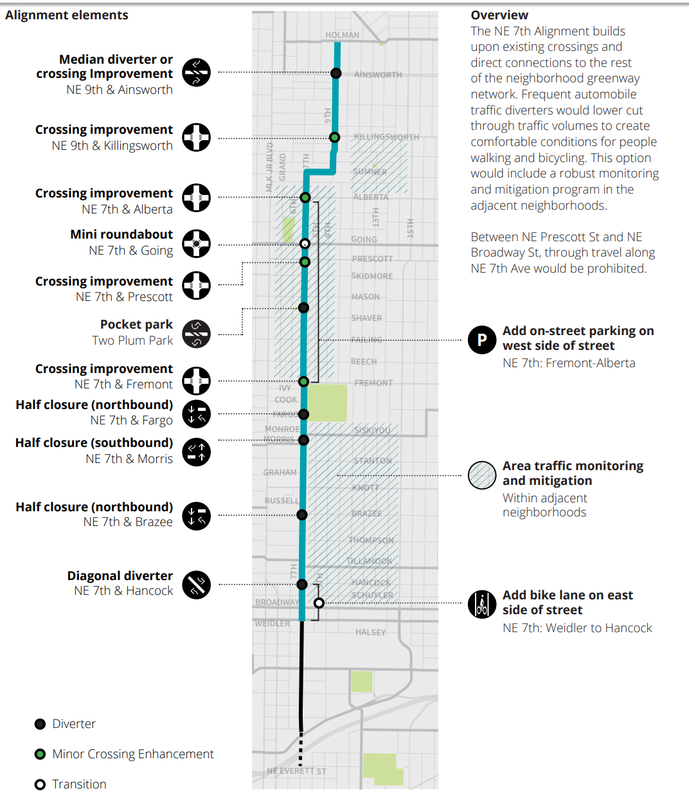 Additionally, NE 7th is more direct, less hilly, has better quality pavement, and already serves considerably more bicycles than 9th Avenue – it is an intuitive route. The 9th Avenue route being proposed is substantially more expensive due to repaving required south of Knott Street and additional signalized crossings that would need to be built, as well as a bike path around the perimeter of Irving Park ball fields. Are we ready to take bold action to calm NE 7th Avenue, or are we going to build out a route on NE 9th that will be underutilized, more expensive, and indirect? Allan Rudwick is the Land Use Chair for the Eliot Neighborhood Association.